House and Universe, video projection: Sky Gallery on the Cube, Kitchener City Hall, June 21, 9 - 11 PM. House and Universe: Sphere, performance, June 21, 7 - 9 PM, Kitchener and Waterloo. House and Universe: Sphere and Cube consists of two sculptures, a sphere and cube made from personal objects tied together, and six photographs illustrating the artist's performance practise. During the Summer Lights event on the June 21st, Mary Mattingly will lead a procession along King Street beginning at Kitchener City Hall and and ending at Waterloo Public Square. 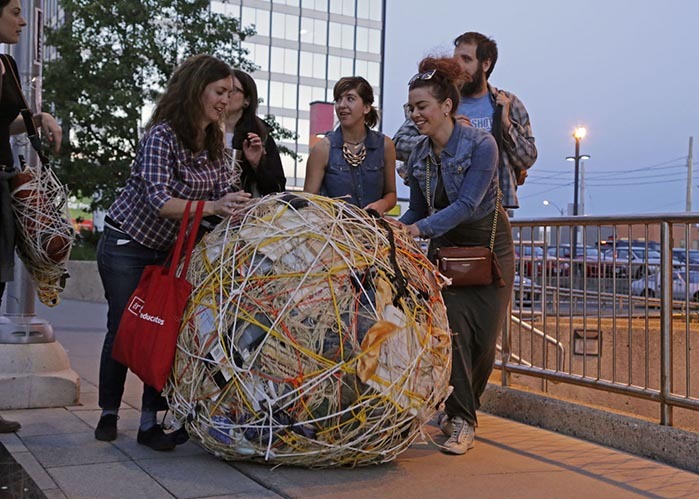 Participants will take as few or as many of their personal objects and bundle them together, carrying rolling, or otherwise transporting their bundles with along the route. During the evening of the procession, there will be a video slideshow on the Kitchener City Hall Cube of photographs of personal objects from Mary Mattingly's sculptures. Mary Mattingly is an artist based in New York. Her work has been exhibited at the International Center of Photography, the Seoul Art Center, the Bronx Museum of the Arts, the New York Public Library, deCordova Museum and Sclupture Park, and the Palais de Tokyo. She participated in smARTpower initiated by the U.S. Department of State and the Bronx Museum of the Arts. She has been awarded grants and fellowships from the James L. Knight Foundation, Eyebeam Center for Art and Technology, Yale University School of Art, the Harpo Foundation, NYFA, the Jerome Foundation, and the Art Matters Foundation. Her work has been featured in Art in America, Artforum, ArtNews, Sculpture Magazine, The New York Times, New York Magazine, Financial Times, Le Monde Magazine, New Yorker, The Wall Street Journal, the Village Voice, and on BBC News, MSNBC, Fox News, News12, NPR, WNBC, and on Art21's New York Close Up series. In 2012 she launched the Flock House Project: three spherical living-systems that were choreographed through New York City’s five boroughs. Mattingly also founded the Waterpod Project, a barge-based public space containing an autonomous habitat that migrated through New York’s waterways. Over 200,000 people visited the Waterpod in 2009.